Digital Eyes is a solution developed by Ray Seymour to help his friend Vincent Wojtusik get around the house. Vin is a blind citizen and one day, while visiting his home, Ray realized that Vin’s walking cane was insufficient to help him get around the house. Digital Eyes is a hand held rangefinder that works with the iPhone. According to Ray, it’s a flashlight for the blind that helps them to more easily navigate their surroundings. Functional prototypes have already been demonstrated in the Kickstarter campaign video. Digital eyes works by measuring the distance using the two sensors that fit inside the snap-on device, and when the user gets within a certain distance of an object, an alert is given. 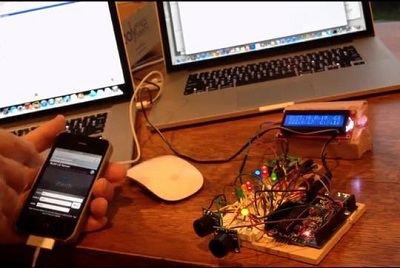 Low energy Bluetooth will be used to process the signals to the user’s smartphone, which will give the alerts. Currently, the development team has started a Kickstarter campaign with a target of $48,000 to raise funding to further develop the gadget. Long range plans include a software development kit for users to develop new applications for the range finder. 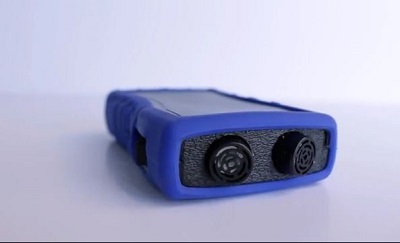 A testing plan has been developed to document the issues, and as the device runs on a 9Volt battery, the product can be sold without additional approvals from UL. The first units are expected to ship in September 2014 so for those of you who have blind family or friends, this is a must gift gadget.